IDI Composites International (idicomposites.com) partnered with Horton, Inc. (hortonww.com) to produce a high-strength composite fan blade that excels at engine cooling in harsh environments. IDI Composites International is the premier global custom formulator and manufacturer of thermoset molding compounds for molders and OEMs providing customized polyester/vinylester-based bulk molding compounds (BMC) and sheet molding compounds (SMC) and a new line of Structural Thermoset Composites (STC®) that are manufactured in both sheet and bulk formats for the most demanding applications. Each IDI SMC and BMC is custom formulated to offer a wide array of performance characteristics including high performance and high-strength, heat and corrosion resistance, low to no shrink, UV stability, low smoke and flame spread and flame resistance. IDI’s materials were a perfect choice for Horton when they wanted to develop a superior fan blade to cool the engines of large vehicles and stationary equipment for mining, construction and the oil and gas industries. 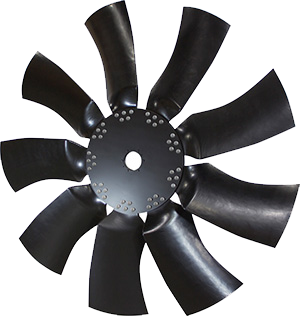 The high-strength composite fan blade was designed to overcome limitations that metal fans run into with equipment operating in difficult environments. Horton’s computer-optimized blade designs allow for improved airflow performance and reduced noise, previously not achievable by stamped metal blade designs, are now possible to mold with a composite material. The material strength-to-weight ratio and durability allow high fan speeds in operating environments with vibration, dust, grime, corrosive elements and temperatures that range from frigid to scorching, and the material allows unmatched durability to reduce maintenance costs. The resulting fan performs more efficiently than current metal fans in the market, improving airflow performance, reducing noise and fuel consumption. The new blade designs are not limited to engine cooling, allowing for expansion into many aspects of airflow management in harsh environments, such as cooling towers or agricultural ventilation. 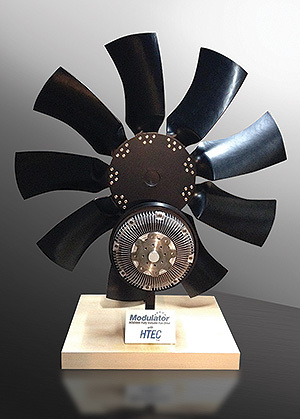 IDI Composites International and Horton Inc.’s HTEC (Horton Thermoset Engineered Composite) fan blades are nominees for the 2015 CAMX Awards for Composites Excellence (ACE) competition in the “Market Growth: Infinite Possibility for Market Growth” category. The ACE awards are a prestigious composites industry competition, recognizing outstanding achievement and innovation in technology, manufacturing and product development. ACMA, host to the long-standing awards program, will present six awards in three categories in Dallas at CAMX 2015. At IDI Composites International (IDI), we’re about thermoset composite materials and ideas to make your products better.